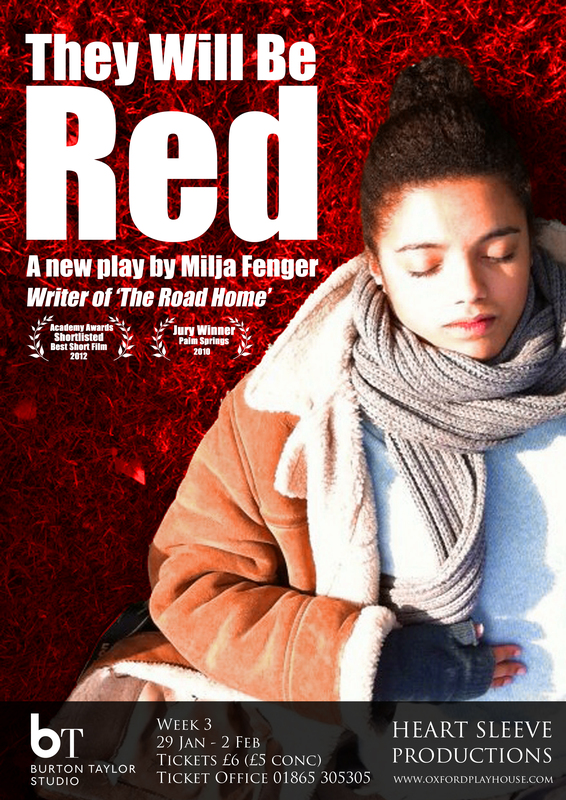 Following her successes with the short film ‘The Road Home’ (Oscar shortlisted) and her play ‘She Was Yellow’ (shortlisted for ‘Old Vic, New Voices’) last year, Milja Fenger’s new play ‘They Will be Red’ will be running at the Burton Taylor Studio from 29th January – 2nd March. ‘They Will be Red’ tells the story of Anna, an ecologist whose ambitions to combat the ash tree dieback distract her from a problematic life at home. Currently studying human sciences at Oxford, I spoke to Milja about the play and how her academic and dramatic work intersect. What’s the inspiration behind your play? Originally, I didn’t want to do a play. Then one day I was walking in the park, looking at the trees and it struck me that the ash trees, which were so beautiful, were still going to die. And I wondered what it would be like if I became someone who worked on that; what sort of things would I come across? The main character has a sister who has Hodgkin’s Lymphoma, and is getting increasingly ill throughout the play. She finds it very difficult to deal with and I think she becomes obsessed with these ash trees, simply she doesn’t want to see her sister, who is the most important thing in her life, breaking apart. She doesn’t have a partner, she adores her sister. It’s never said this way, but she feels that if only she can solve this ash tree problem then maybe someone else can solve the problem of her sister’s health. I just want to make a story. I don’t want to make the most amazing thing in the world, and I want to have fun. Normally I’m quite a perfectionist but this time I’ve given myself and the actors two and a half weeks to write and rehearse it. We’re in the middle of that, two-thirds of the way through the script. It’s been very interesting to see how difficult it is on some days, and how exhilarating on others; sometimes you come up with scene after scene in a few hours. Other times nothing will get done, and you don’t have enough time to work on the acting. Is it entirely your script or a more collaborative project? It was originally supposed to be mine, but now it’s more devised. I let the actors improvise some things I think should be explored, and then we do that maybe three times, and I take out and write down everything that is good. Is there any symbolism of the colour in the title? My first play was called I am Green, and another She was Yellow, and this play has many of the same themes in it. But the red is just about when the trees get this disease, the leaves go a browny-red instead of yellow in Autumn. Is your approach to how and what you write mediated by your academic work? I think my academic work is more influenced by how I was trained to be creative. I try and follow my intuition as well as logical thinking. But the themes, of course – in a way I feel like this play is a bit of a criticism of science? Or at least the bad parts of science; the funding, the focus on getting published. This sounds very critical, but I do love the general idea of trying to find out more knowledge. Ecologists in general are very passionate, and I love that. I think people are not really aware of how the scientific world actually works and I think people can see more about that. In a film like The Fountain you see this man running into his office shouting ‘I’ve got it I’ve got it!’ It’s not like that at all. You’re always collaborating, you sit for hundreds of hours looking through the most boring things just to make sure the computer hasn’t made a mistake, but these things are still interesting. Where did you ‘train to be creative’? I suppose it’s a somewhat stupid way of putting it – training to be creative – it doesn’t really work. But I went to drama school for three years. One teacher specifically was very strict on me because I was always thinking too much. I like logic, and I like to put numbers on things – like Anna, the character in the play. Time and time again he would scold me for it, tell me that I needed to do some things without thinking at all. It really taught me that you can do much more amazing things by just doing – by sitting in your bed and writing when you’ve just woken up and still sort of sleeping. Or to get on stage, as an actor, and simply perform. It’s a very emotional feeling, and it’s easy to think about how to convey the terrible thing has happened to this character, or to try and think about other things like your lunch, but when you just get on stage and perform, things come out of you that you don’t expect. This is supported by neuroscience; there’s so much going on in the brain that we don’t know about but we can try and allow that to come out by not blotting it over with our more logical brain. Are you hoping to carry on writing and directing? I’m not sure. I’m hoping to do a masters in Europe in environmental science. I care a lot about the environment and I’d like to work in that but at the same time things like documentaries are probably the best way to make people care. Do you think that on-stage drama is an efficient way to raise awareness of political issues such as environmental change? I think ‘awareness’ is probably not that good a word. In this case, we’re in a small theatre, there will be maximum 250 people who see it. But I think it’s more about the feelings you can create in people? If you manage to tell a story – it doesn’t even have to be about the environment – but a story about responsibility and being aware of the world around you, for me stories can change the way you look at the world. Theatre is very effective in this, as emotions can be very raw. Do you think that responsibility is something that’s particularly important to stress at the moment? Yes. It may sound old-fashioned but when I look around me I find it quite shocking how easy it is for everyone to forget that they are part of a society, that they’re very much supported by the structures and people around them. Essentially, we’re living this well because of the suffering of other people living across the world. It doesn’t mean you have to actively do something about it, but at the very least you should consider it and not be able to just live in delicious, ignorant bliss. Maybe things are changing, people are listening; but I find it very funny that…the most aware people do horrible things and find excuses for it, so I think as a society we should remind each other that we have a responsibility. I want to be reminded by the people around me. I think plays can have a role in that. Do you think that something like acting is important to teach at a young age, something that encourages children to be spontaneous? We have a very exam-based system, do you feel there could be a greater allowance for personal expression? I love living here, and I love Oxford, but I want to go as I do not want my children to grow up in England and go through this education system. I think it kills creativity. They [the government] try to change things, but coming from the outside the focus doesn’t seem to be on the right changes. They’re very protective about the basic structure of education. Of course, for some people they flourish because they get chosen and they excel in exams, but in general children have so little chance to do well. And there is a constant focus on exams. I’ve had one exam in my whole school life [in Holland], over 14 years; one important exam when I was 18. But the rest of the time you just go on to different levels of high school. It’s flexible and you can change, but from age 13/14 you can go to a different school depending on whether you are more academically or practically minded. In Holland there isn’t much of a focus on the arts, we didn’t get drama lessons, music lessons, as much as here. But people are willing to give their opinion – to have opinions – and I think that’s very important when you try to create things. I find with a lot of English theatre and film that sometimes it’s amazing, and more amazing than anything else I’ve seen, but a lot of the time I find it a bit boring and not very daring. It doesn’t mean it has to be strange or experimental, but simply more real or alive. Suddenly you see an Israeli piece by a bunch of students and you cry and laugh, and there are humans on the stage. Which plays have really struck you? The one which has stayed with me, I think will stay with me forever, is a play called Dimetos by Athol Fugard. I saw it at the Donmar Warehouse, on the last day that it was on; I got a free ticket through an under-25 scheme, I would never have gone otherwise. It was an extraordinary experience. In the first half there was a short monologue by a girl, and in that short time I started accepting my womanhood. I’m fairly voluptuous, and I was always fighting against this idea that people saw me as a woman, as a sexual, sensual being when I felt like a small girl. In that one speech, something happened inside that made me accept that this was the case. Then there was another half to go, which was about very different things. I don’t quite understand what was happening but Jonathan Pryce, the main actor, spoke a few lines, and without him saying anything emotional or looking particularly emotional his pain, which became apparent a few minutes later, hit me in the audience and made me sob. It didn’t give any answers, it just asked questions. It was amazing. ‘They Will be Red’ is running at the Burton Taylor Studio from 29th January – 2nd February 2013, tickets £6 (£5). To book tickets please visit the Oxford Playhouse Website.